Lewis Hamilton took a giant step towards a fifth world championship with victory in the Russian Grand Prix. 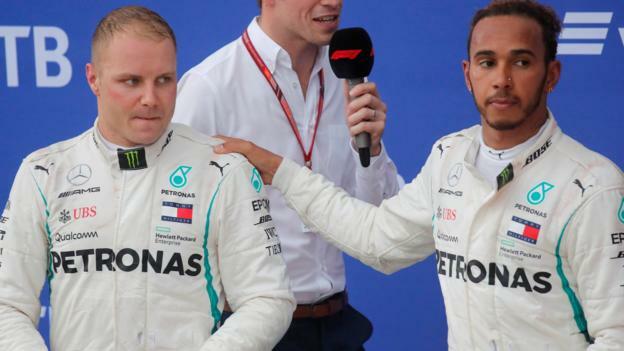 Hamilton benefited from team orders as Mercedes told his team-mate Valtteri Bottas to let him by at half distance to protect against rival Sebastian Vettel. But Hamilton had to pass Vettel on track to get into a position to benefit from the orders after being passed at the pit stops. And Vettel survived an investigation for driving dangerously while racing Hamilton. For a short time around the pit stops, it appeared as if Vettel might have done what he so badly needed – and got himself in a position to claw back some championship points on Hamilton. Bottas led away from pole position, and the Finn’s slipstream enabled a slow-starting Hamilton to fend off Vettel’s attack into the first corner. They circulated in grid order until the first pit stops – when Mercedes’ plans began to go awry. Bottas stopped first, on lap 12, with Vettel following him in a lap later. Hamilton started setting fastest sector times and initially looked as if he might leapfrog Bottas into the lead. But he then hit traffic, having to lap the Williams of Sergey Sirotkin as he headed for the pits on lap 14, and that made him vulnerable to Vettel. The Ferrari was alongside the Mercedes as Hamilton emerged from the pits, taking the position – third on the track but a de facto second – as they headed into the first corner. But he was not to be denied, and immediately began to attack Vettel. Starting lap 16, Hamilton was right behind the Ferrari and the German was bordering on illegality with his defence from the Mercedes driver’s on the inside. Hamilton ducked to the outside, to get a better line through Turn Two, followed Vettel closely through the long, flat-out Turn Three and dived for the inside into Turn Four, where Vettel abandoned the aggressive defence he had employed just before. Hamilton complained over the radio that Vettel had illegally moved twice in defence down the straight, and his driving was investigated, only for the stewards to decide to take no further action. Hamilton was now running third, behind Red Bull’s Max Verstappen – driving a brilliant race from a back-row starting position on a different strategy with a long first stint – and Bottas. With Verstappen in front, Bottas was not able to stretch his advantage and he, Hamilton and Vettel were running line astern. Hamilton was struggling with his tyres, which were developing small blisters, and Mercedes were worried about Vettel being right behind him. So Bottas was ordered to move out of the way at Turn 13 on lap 25, and Hamilton assumed second place. Bottas was not happy, saying over the radio that he had been preparing a move on Verstappen on the next lap – which did not sound very credible given the nearly two-second gap. Chief strategist James Vowles came on the radio, a rare occurrence, and explained Mercedes could not take the risk with Hamilton’s damaged tyres and Vettel right behind him. When Verstappen finally pitted on lap 43, Hamilton assumed the lead, and he led Bottas and Vettel home. Verstappen drove a brilliant race on his 21st birthday, carving through the field from his 19th place on the grid, caused by penalties for using too many engine parts. Starting on the hardest tyre and aiming for a long first stint, Verstappen was up to 12th place by the end of the first lap and by lap nine was into fifth – while team-mate Daniel Ricciardo, who started one place ahead of him, was still 12th. Verstappen inherited the lead as the Mercedes and Ferraris in front of him pitted. And after his pit stop, he emerged in fifth place, 14 seconds behind Ferrari’s Kimi Raikkonen. But the gap was too big for Verstappen to close and he took a comfortable fifth ahead of Ricciardo. Verstappen was scintillating in the opening laps, carving through the field like a warm knife through butter. He takes it for that. The Japanese Grand Prix at stunning Suzuka, arguably the greatest track on Earth. If Vettel can’t eat into Hamilton’s lead there, the championship is all but over.